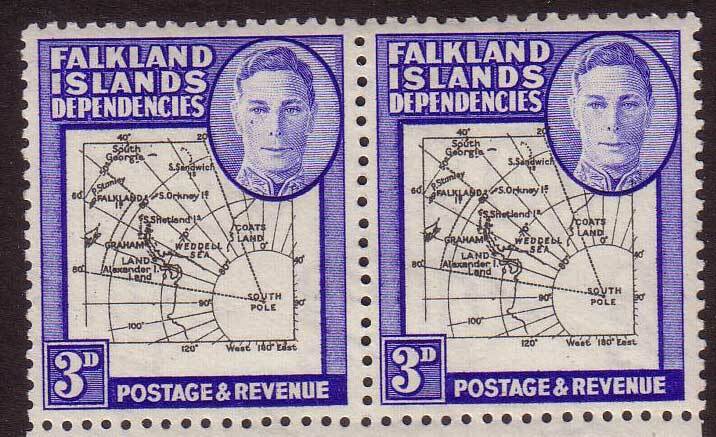 This post is going to deal with identifying some of the flaws in the Falkland Islands Dependencies ‘Map’ issues. 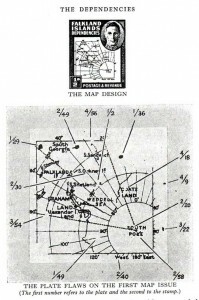 There are two printings to deal with, commonly referred to as the thick and thin maps. Really the first thing to do is identify which set we are dealing with. 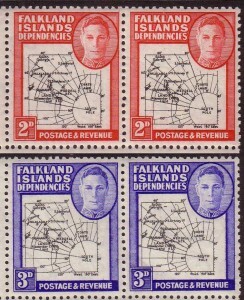 The first set produced was the thick set, which ran from 12th July 1946 through to 1949. 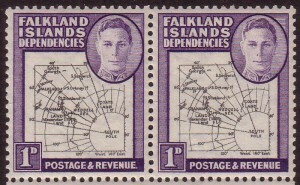 The later thin map set was introduced in 1948 and is the more valuable set in terms of money. So let us start with looking at thick and thin maps together. Here are two 1/2d greens, the thick map is on the left and the thin on on the right. Blown up this large it’s pretty apparent that the thick set is printed thicker than the thin, so that all makes sense already. Sometimes it can be harder to tell though and so there are a couple of further ways of knowing for sure. Click on the image to see it larger. 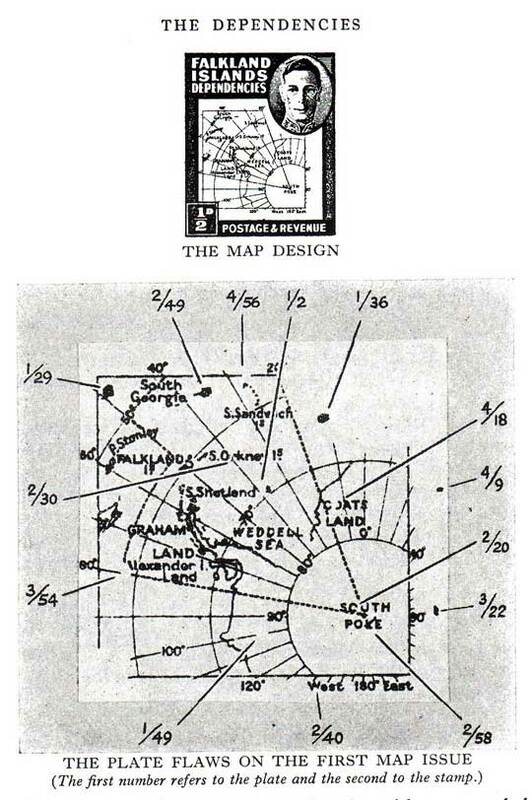 If you examine COATS LAND under the portrait, in the thick map the meridian passes straight through the S. Whereas on the thin map the line respects the S. Also if you look at Alexander Land; the ‘n’ in Alexander runs into the ‘L’ of land. On the thin map there is a clear gap. So that’s the how to tell the difference in the sets. There are a few flaws known on the thick maps, which I will deal with here. I will leave the thin maps as I don’t have any example of the flaws to hand. 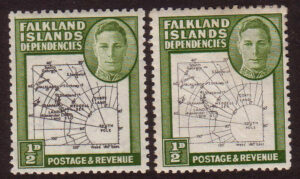 I have lifted this image from a very good book; The Postage Stamps of the Falkland Islands and Dependencies by B.S.H. 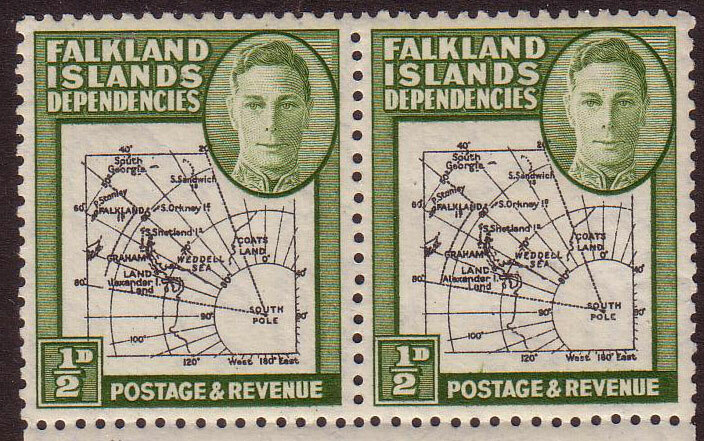 Grant, which identifies a lot of flaws in these stamps. I will be showing you some that are not listed here too, but I do not have examples of every variety as yet. The first flaw we will look at is the ‘Alexander Land’ one. Here it can be seen on the 1/2d green. 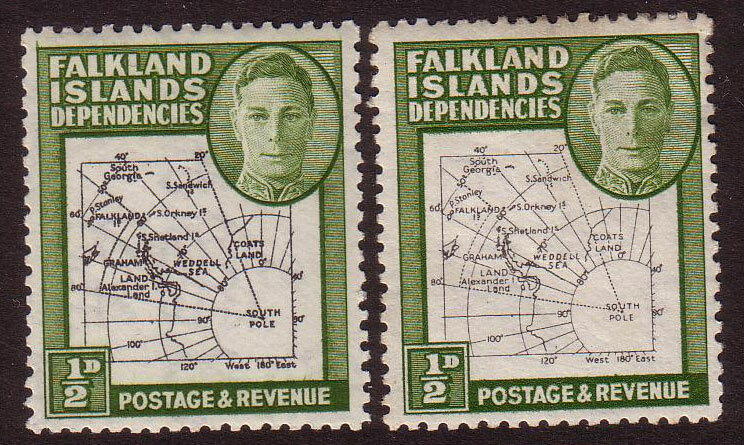 The left stamp shows the flaw. You should see that the A is mostly not there and a large segment of the map lines are not there at all. As always click the image to see it larger. 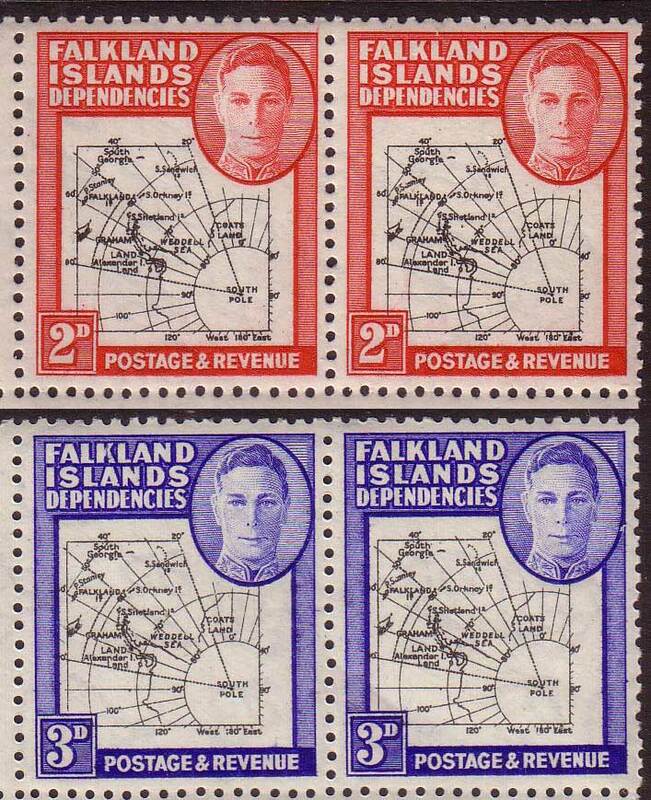 Here is the same flaw on the 1d, this time on the right hand stamp. Next we have two blocks showing three flaws. 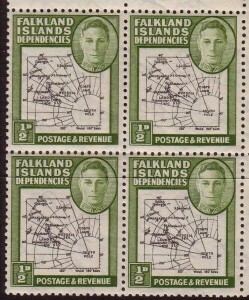 The top right stamp shows the Gap in the 80th parallel as noted by Stanley Gibbons. This is not shown on Grant’s flaw map but he does mention it. Gibbons has a price for this flaw, which is known as the ‘Broken arc’. This is an example of a group transfer error. 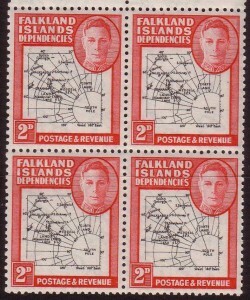 The upper left stamp also shows another group transfer error where the 50 degrees meridian continues with a small dash. The same is so in both blocks. COATS and 80th parallel flaws. Now for some flaws not listed by Grant, Gibbons and most others that I can see. The next block again shows the gap in the 80th parallel. 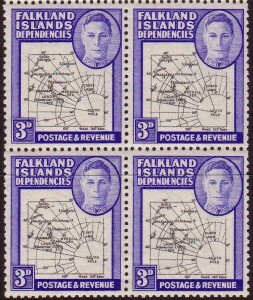 The bottom left shows the ‘1’ in ‘100 is shortened (look above the O in Postage). 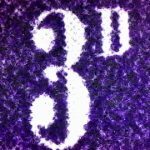 Here is a flaw in Port Stanley shown on both the 2d and 3d. 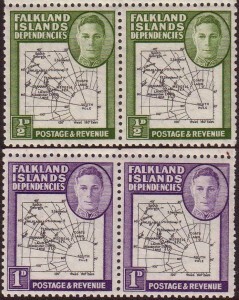 Right hand stamps; ‘t’ missing from ‘P.Stanley’. Again it shows the flaw is consistent. And finally for this outing, here we have a ‘tear’ in the King’s portrait – left hand stamp. So there you have it, a few examples of some flaws, although many are not in the catalogues. Good hunting ! 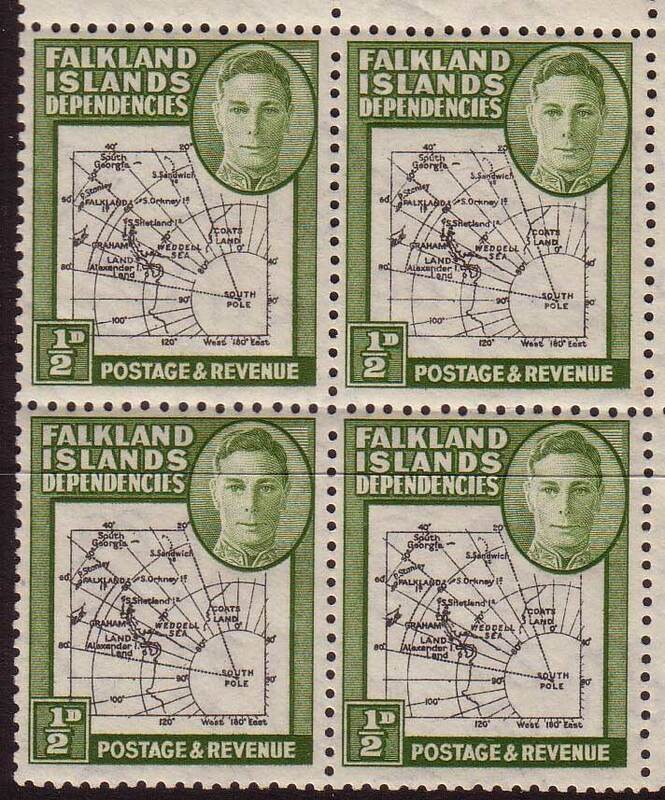 Printed by De La Rue & Co Ltd. Watermark Multiple Script CA sideways. Perforation 12. Sheets of sixty (six rows of ten). 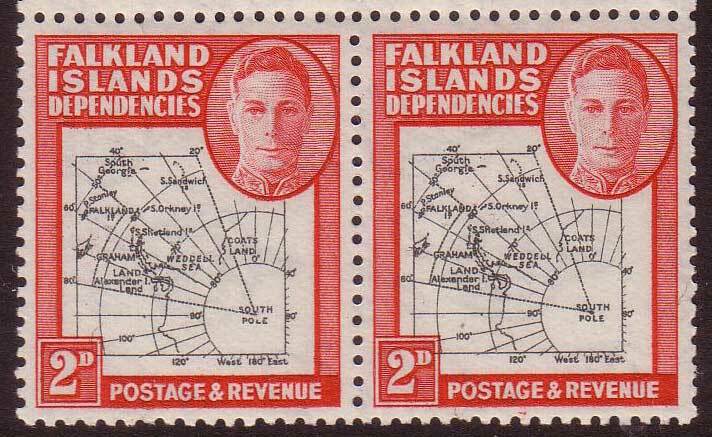 A flaw is known as a defect in a plate that reproduces as an identifiable variety in the stamp design. 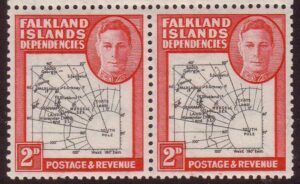 ~Stamp Glossary. 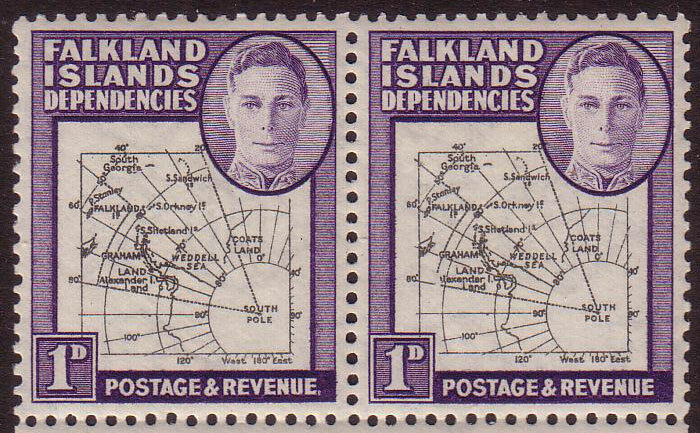 Some of the flaws shown here, such as the gap in the 80th parallel, are known as Group Transfer Errors. They appear six times in each printed sheet because the whole sheet was made up in groups of ten. Others are known as Individual Transfer Errors. I just used the term flaw in most places as it’s less of a mouthful. 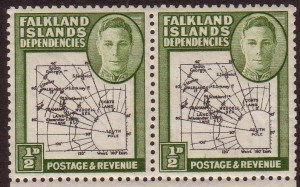 The Postage Stamps of the Falkland Islands and Dependencies by B.S.H. Grant – shop around. Make this your second comment – I had merrily been collecting one of each thinking I had the lot – I’m now off to double check my sets to see if I can find any flaws! And to figure out if I have thick or thin maps! Thanks for this. Have you read the guide Published by the King George VI Collectors’ Society or Larry Goldberg’s photographic guide? 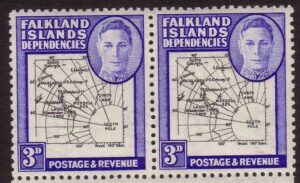 No to both – I have the collectors society on my places to join list though, I note they have a publication on the Falklands. Also this is the first I have heard of Larry Goldberg’s work. 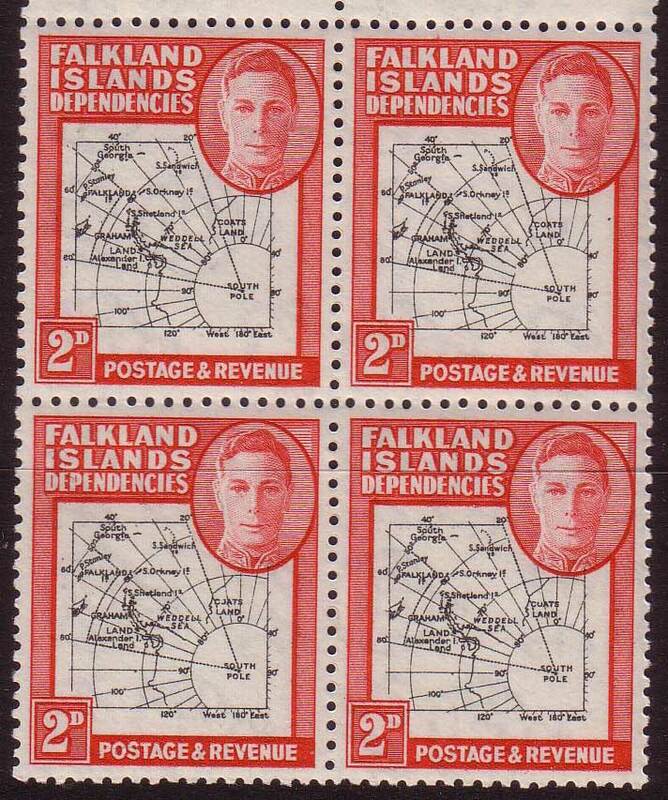 It is a wonderful set of stamps if you fancy plating the thick maps. 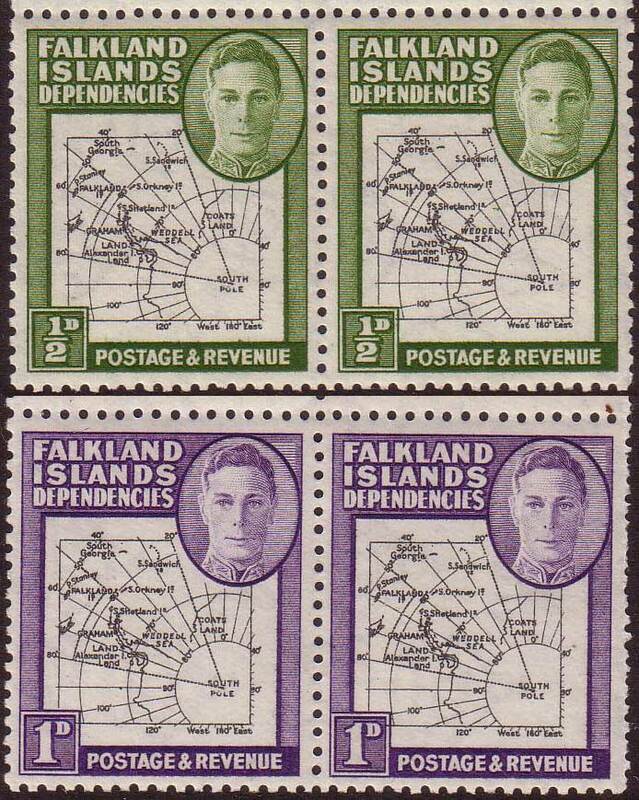 Most interesting of all the KGVI definitive issues. 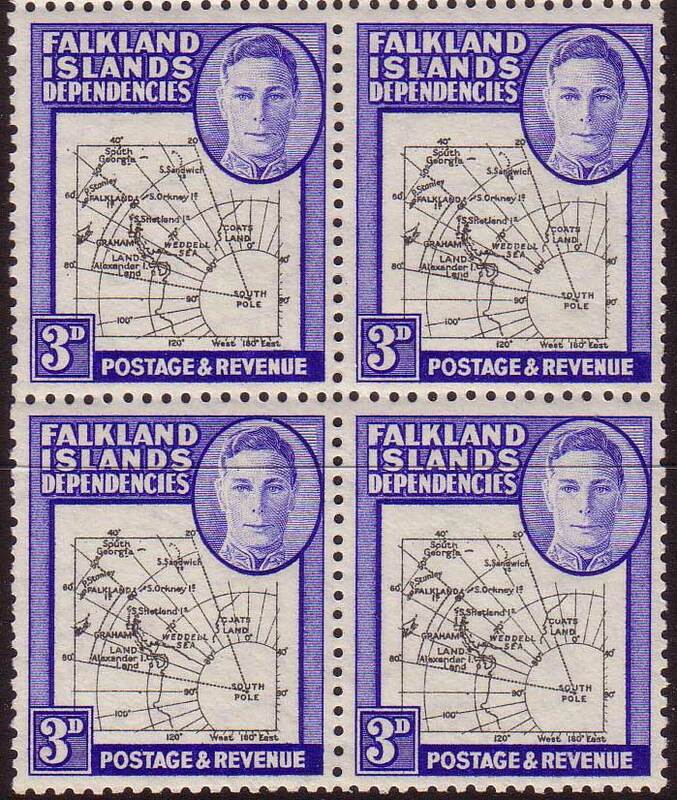 Lots more research to be done and stamps to be collected. It is now possible to collect 10 different sets based on the secondary or group transfer flaws. email: jowbespencer@hotmail.com for more info. There is another very good unlisted flaw. Probably missed by most people or discounted as a blemish. Its a spot which appears on the King’s right cheek/upper lip/ lower lip/chin. It appears to move around because of the poor registration between the map plate and the duty plate. However it is a constant map plate flaw. Unfortunately I can’t post any scans on my comment. I’ll try to email them to you.